The future growth of the Guangdong-Hong Kong-Macao Greater Bay Area must pursue a high-quality economic expansion model to be driven by the innovative sector, according to scholars. Compared to other bay areas around the world, like those of San Francisco and Tokyo, the GDP per capita in our Bay Area is lower at the moment, but we enjoy the advantages no other bay area in the world has, reckons Chen Guanghan, associate dean and chief expert at the Institute of Guangdong, Hong Kong and Macao Development Studies at Sun Yat-sen University. Speaking to China Daily after a panel discussion at the Belt and Road Conference on Monday, he noted that the economy of San Francisco's Bay Area is driven by its high-tech and biomedical industries, while that of Tokyo is propelled by high-end manufacturing. China's Bay Area has a bigger population, a larger economic hinterland and a more complete industry category. "The Bay Area must pursue high-quality economic growth, and I believe this will be driven by innovation," he said. Chen explained he drew his conclusion from the fact that Hong Kong, Shenzhen and the Pearl River Delta region are complementary to each other. Hong Kong and Shenzhen are already very competitive in terms of innovation, he said, adding that when Hong Kong returned to the motherland in 1997, it announced it aimed to turn itself into an innovation center in the Asia-Pacific region. The proposal did not reach a broad consensus back then. But, in recent years, the Hong Kong Special Administrative Region Government has been attaching greater importance to developing the innovation-and-technology sector. Hong Kong is bankrolling a big effort in research and development by allocating a further HK$28 billion to boost innovation - a bold target set by Chief Executive Carrie Lam Cheng Yuet-ngor in her second Policy Address on Oct 10 this year. She had vowed to double expenditure on research and development to 1.5 percent over the next five years in her maiden policy address in 2017. At the same time, Financial Secretary Paul Chan Mo-po pledged to dish out a massive HK$50 billion from the budget funding pie to support innovation and technology this financial year. Chen believes that Hong Kong's world-class universities and international research environment will make the city a perfect place for cultivating talents and conducting fundamental research, while Shenzhen will be great in commercializing the fruits of such research. The traditional advantage of manufacturing in the Pearl River Delta region will then take the products to end-users in China and the rest of the world. Besides, Hong Kong's status as an international financial hub will allow it to play a vital role in funding and incubating the innovative projects, he said. The Bay Area development will also provide a huge boost to the nation's Belt and Road Initiative, particularly to the Maritime Silk Road. 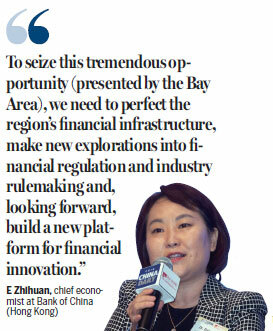 With Hong Kong as a global financial hub and Shenzhen and Guangzhou as regional financial centers, the Bay Area can be the investment and fundraising focus for BRI projects. The Bay Area has many large ports, as well as seven airports, and the 11-city cluster will be a transportation and arbitration center for BRI projects, according to Chen. "Since the cities in the Bay Area complement each other, they will play a great part in the Belt and Road Initiative," he added.